Comments will be accepted by Metrolinx until October 7, 2015. 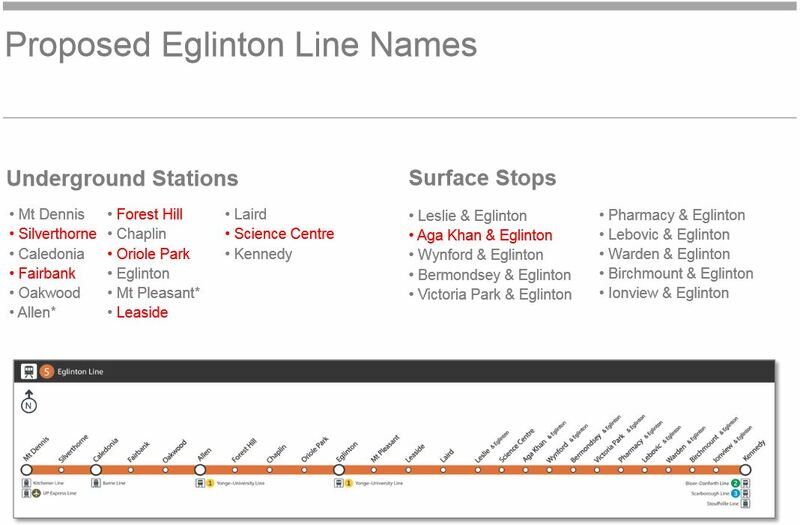 Although the consultation affects only the stations listed in red in the list above, other changes are proposed including renaming “Eglinton West” to “Allen”. The asterisk beside “Mt. Pleasant” is actually an error, and should be beside “Eglinton” because the proposal recommends a “change” from “Eglinton-Yonge”. Of course, the station isn’t called that yet. The comments that have already been left on Metrolinx’ site suggest that many of their proposals are not exactly popular. I cannot help think that whoever is responsible for this report has a poor sense of Toronto (maybe another consultant who does all their work on Google Maps? ), nor a sense of which neighbourhood names are actually used. I cannot help think of the mystery surrounding stations at “St. Andrew” and “St. Patrick” that memorialized old ward/parish names that almost nobody knew fifty years ago, but which are now an inherent part of the city’s mental map of itself. Taking old names for an area may provide an historic link, but confuse people who have no idea of where these places are. Of course we already have a precedent with Steeles West Station that has been renamed “Black Creek Pioneer Village” in reference to an attraction that is quite a distance from the station, and we almost got “University City” for Finch West. Has anyone noticed, by the way, that this is called “Keele & Finch” in the “future” map in the report, “Leslie & Eglinton” is labelled “Sunnybrook Park” on the same map, and SmartTrack is nowhere to be found.